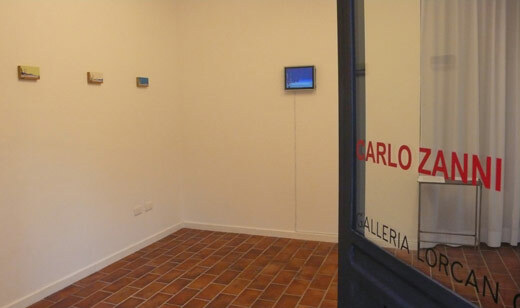 Galleria Lorcan O’Neill Roma introduces “Street View”, a series of short exhibitions by young artists in the gallery’s secondary space, located on the corner of Via Orti d’Alibert and Via della Lungara. Street View’s first project is with Carlo Zanni, a Milan-based artist. Over the past three years, Zanni has exhibited work at the New Museum in New York, the Institute of Contemporary Art in London (his first retrospective), and the Hammer Museum in Los Angeles. Zanni works with technologically advanced media, moving between painting and sculpture, film, photography, net-art and conceptual art. His works create sophisticated metaphors that are connected, through fiction and poetic reinterpretation, to the political, social and psychological realties of our time. Whether still or in movement, the images in Carlo Zanni’s works always derive from a source of statistical data or news acquired in real time from news outlets available online. This data is then translated into visual forms and elements by way of complex algorithms and technological solutions, that ultimately render them into their final forms of landscapes, film, or video-scuptures that are in perpetual evolution. This show includes two past works by Carlo Zanni, eBay Landscape (2004) and The Possible Ties Between Illness and Success (2007): the first, presented via an LCD screen and four small paintings oil on board paintings, is an online Japanse landscape that is constantly modified using data flow captured in real time from the internet. The oil paintings, which complement the work, are a handmade “archive” of four different instants in the stored memory of the work, which has been in continuous movement since 2004. The Possible Ties Between Illness and Success is a short two-minute film altered by a flow of internet data, re-edited “server-side” on the basis of web statistics of the hits to the associated site. The theme is the relation between forms of manic-depression and personal success. The video is presented on an iPod, modified specifically for the work and including a sculpture. Carlo Zanni was born in La Spezia in 1975. He has shown work in numerous museums and galleries, including: Hammer Museum, Los Angeles (2009); Tent, Rotterdam (2009); MAXXI Museum, Roma (2007, 2006); New Museum, New York (2005); Gavin Brown's Enterprise at Passerby, New York (2005); Chelsea Art Museum, New York (2009, 2004); CCA Glasgow (2003); P.S.1 Contemporary Art Center, New York (2001). The ICA (Institute of Contemporary Arts) in London organized his first retrospective in October 2005, and published the monograph “Vitalogy” for the occasion. The exhibition Performa 09, which includes Zanni’s most recent work, “The Fifth Day”, is in progress in New York.